Mick woke with his knee feeling as bad as it has been, but he was determined to forge ahead. We had a later start than we wanted but still had a quick breakfast at the motel and made our way out of town by about 8am. 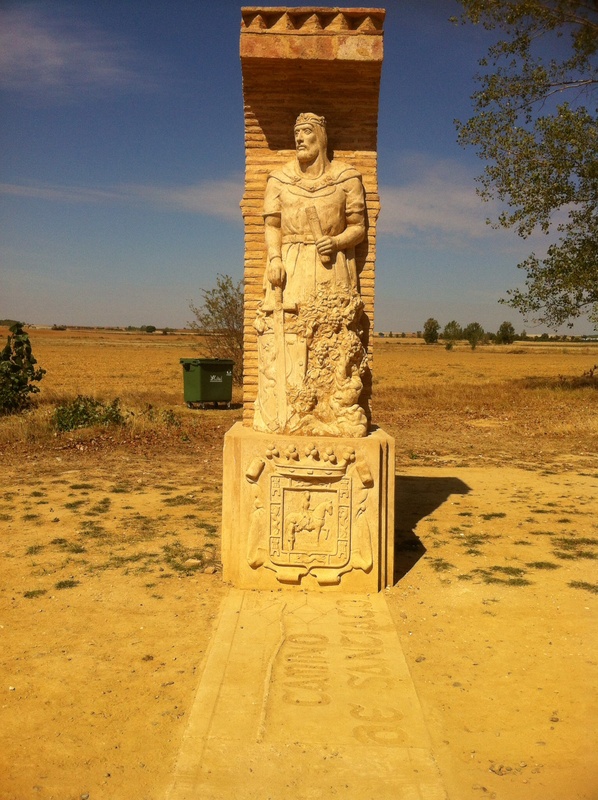 Todays walk was a real example of the Meseta, 17.5km from our current position to our destination, and for the first time on the Camino nothing in between. While it is still easy to see and appreciate the beauty of the barren landscape, it messes with your ability to judge distance and time. We struggled today. Mick was clearly in pain. I had taken some of the weight from Mick’s pack in an attempt to help (against his wishes) but I was feeling the effects of walking with a much heavier pack as well. 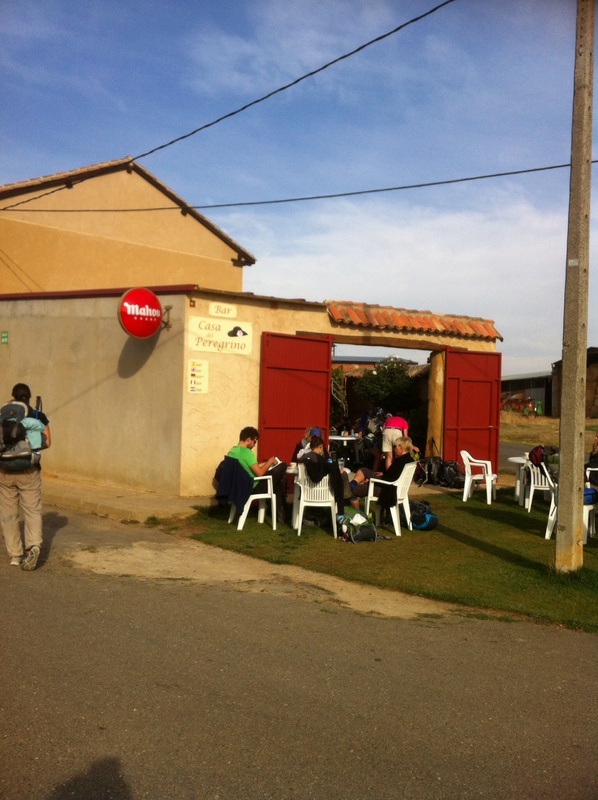 In true Camino camaraderie, many pilgrims walked with us for short distances concerned for Mick’s well being, offering words of support and encouragement. Many offers of heat creams, Camino candy (ibuprofen) etc. Even the distraction of conversation was a great help. We walked for sometime with Vera, an extraordinary lady from Brazil. While she has lived in England for many years she is the trustee of a children’s charity that she and her adult son set up in Brazil. She goes there twice a year to see that the projects are underway. In her early 60’s her pace and zest for life was a real inspiration. The 17.5km on the flat took us a very long time, we didn’t reach our destination until around 2.30pm. Lots of other pilgrims were happy to see us, and very impressed by Mick’s determination. Vera was very keen to buy Mick a cervesa. Calzadilla de la Cueza is a very small village, however the bar at the hostel we are staying at is jumping tonight full of pilgrims. We drink, chat and celebrate the grit and determination that has got us this far. 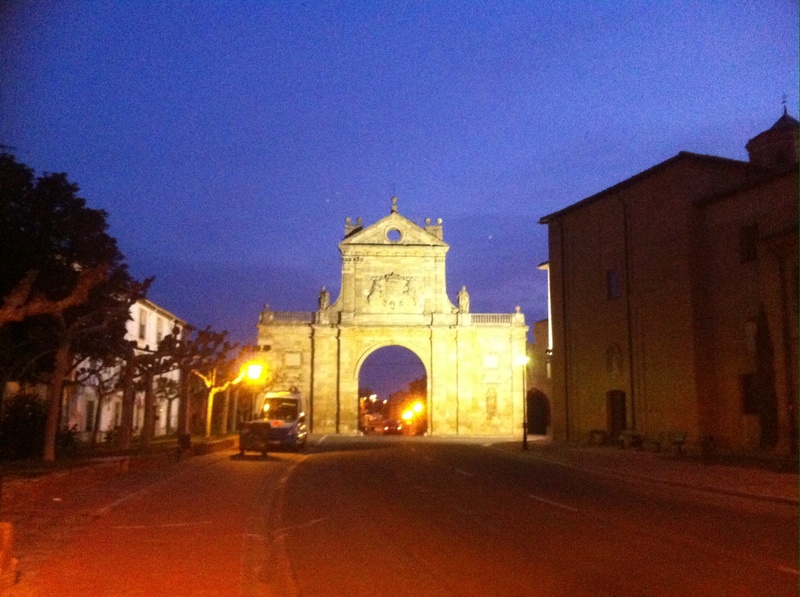 Tomorrow is a big day, we pass the half way mark in the Camino. Yesterday was hell, I spent the entire walking day concentrating on placing my left foot down in a manner that would cause me the least pain, then spent the night drinking too much alcohol. Pam carried our ‘precious’ the bag we have our passports, computer equipment and credit cards in. Fully packed it weighs in at somewhere between four and five kilograms which is almost half of my loaded backpack weight without the precious or water. We walked almost eighteen kilometers and only took our packs off once for a couple of minutes. If we had stopped then I would have stopped permanently. Pam sleeps through most of the night (despite her claim in the morning that she hardly slept at all) while I spend hours grinding out trigger points in my left thigh. Our alarm goes off at six and I am already awake, it takes me ten minutes or so to shake off the lethargy and we have breakfast at the hotel. Breakfast being four small hard dry pieces of toasted baguette for me, and the toast and two coffees for Pam. We could not find any shops selling fruit in the tiny village so for today toast must suffice. At least I could walk down the stairs semi-normally. We set off well before the sun rise, make our way quickly out of town flashing our torch to find the yellow arrows and find ourselves walking on flat gravel paths following the bitumen road. My left knee is much improved today and my pronounced limp of yesterday is gone. Small mercy I give thanks for. I now am sniffing and blowing my nose continuously. Small head cold I blame Pam for. Setting off early in the predawn twilight is far superior to beginning after sunrise. 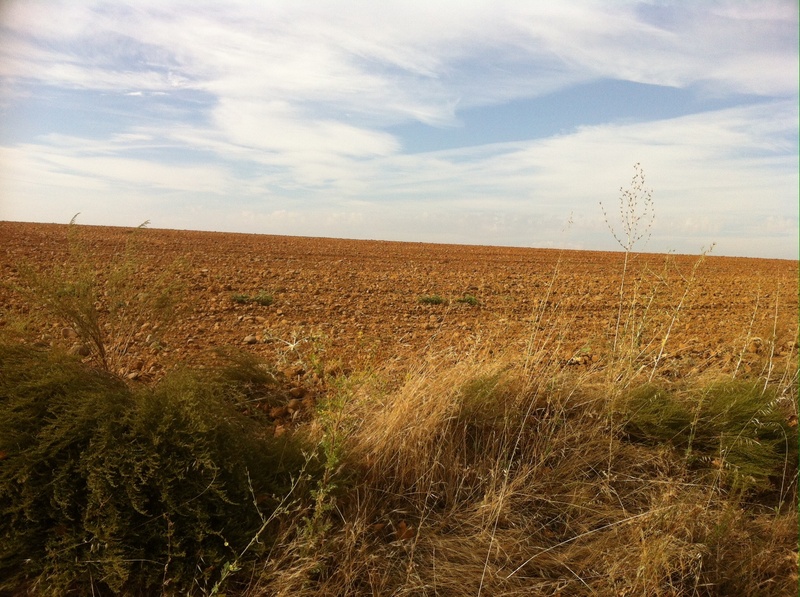 We knock off ten kilometers and have passed through Ledigos and Terradillos de los Templarios by the time the day is getting warm. The Way is once again on a white gravel tracks following beside a small country road not far from the main highway today. Where we are walking is largely spared from the intrusion of heavy machinery for such vehicles only infrequently travel these smaller roads. Walking up a hill we come across a stool sample that was deposited, barely, off the right side of the gravel path. The depositor has placed a rock with his name (Sergio) and the date of the deposit on a flat stone mounted in the middle of the, thankfully by now dry, sample. My mind wanders as to what I shall christen my next bowel movement? I dub thee Percival, Prince of Poops, is what I settle on. Small thoughts for small minds. 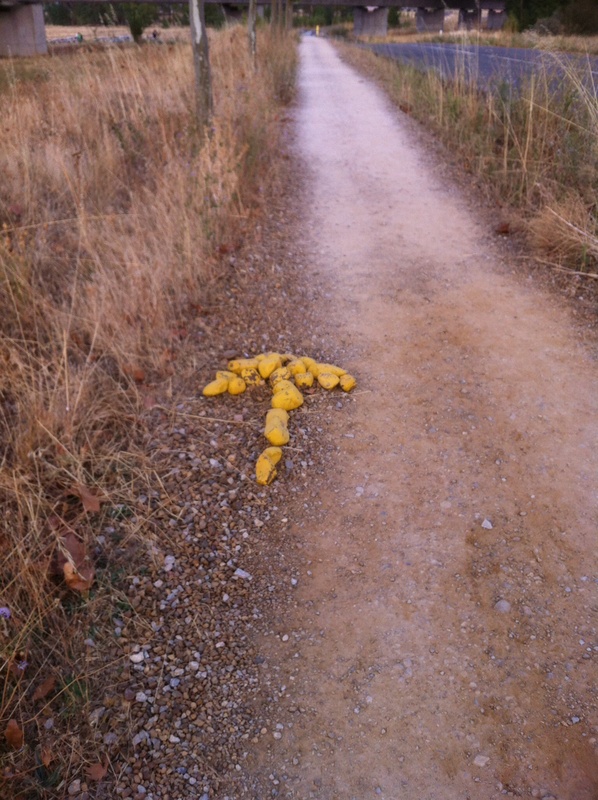 The Way leaves the bitumen after the village Terradillos and follows gravel country roads until the village Moratinos. Somewhere between Terradillos and Moratinos Pam declares we are halfway to Santiago according to her calculations. We kiss and congratulate each other. Apparently it is all downhill from here. Entering Moratinos we see a ‘Hobbit’ home built under the earth with many doors/windows leading to the outside and a white plastic chair sitting on the ground at the highest point of the ‘roof’. We had seen a much smaller ‘hobbit’ house entering Villalcazar de Serga the day before however the house we are now facing is much larger with many openings to the world above. Pam and I are feeling strong still so we continue, after taking some photos, without pause to the next village San Nicolas. 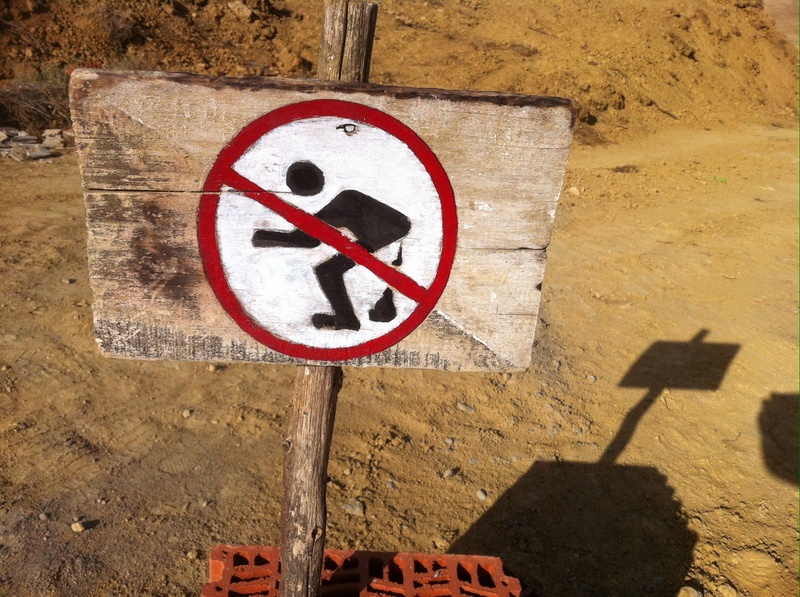 On the outskirts of San Nicolas we come across a building site with another self explanatory sign. We rest for a while in San Nicolas at a bar and have some food and water. The church beside the bar is undergoing refurbishment and we watch two workmen load a bucket on an extending crane with bricks and lumber. One of the workmen then gets in the bucket along with the bricks and his companion raises him to the roof level by extending the crane boom. No harnesses, no hard hats, no safety equipment. My brother in law Ralph who works in OHS would have been having conniptions watching the scene unfold. Later that night we meet an Aussie plumber/avocado grower Ross who told us he saw several pilgrims walk under the extended crane boom. Life is very casual here is Spain, service is generally slow, safety is generally ignored, things happen at their own pace. 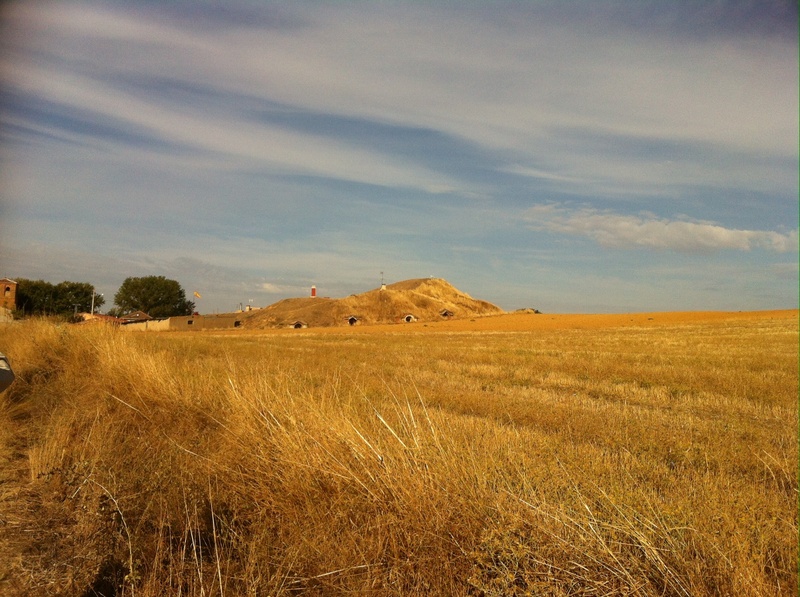 For the walking pilgrim life has generally slowed dramatically also, so our pace matches the pace of Spain well. 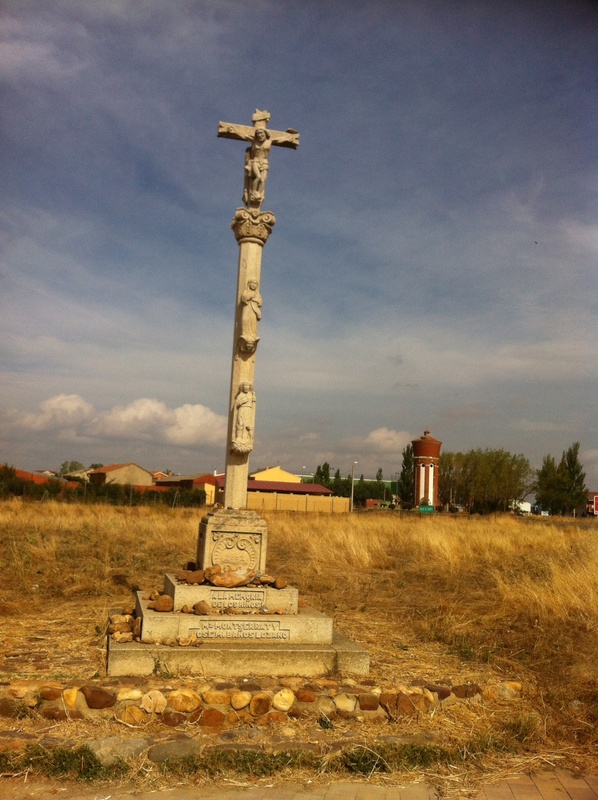 Sahagun is a larger town and experience thus far has led us to believe that the Camino approaches large towns seemingly in concentric circles that make their way around the town five times before entering. Maybe this is an exaggeration however when entering larger towns the Camino definitely prefers the circuitous to the direct path. 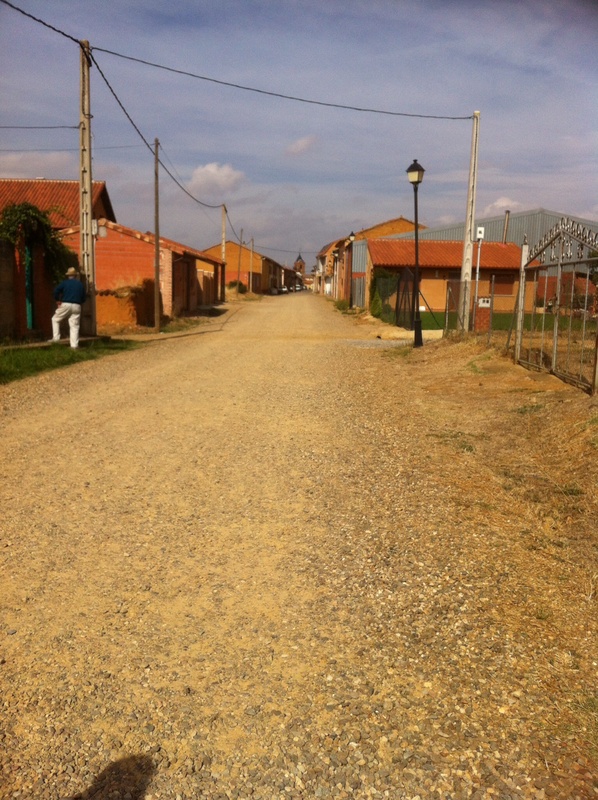 So it is with the entry to Sahagun. We head straight towards town for a while before diverting at right angles and walking for what seemed forever to another small church undergoing refurbishment. We cross a small stone bridge to get to the grounds of this church. There are stone benches and seats as well as rusted steel sculpture pieces that people are sitting on and the gravel path out of the church yard leads between two stern stone monuments of legends of days gone by. We rest in the church grounds on some of the sculpture work, which fits Pam’s anatomy exactly and I find uncomfortable, then leave feeling like Frodo between the two kings of Gondor. 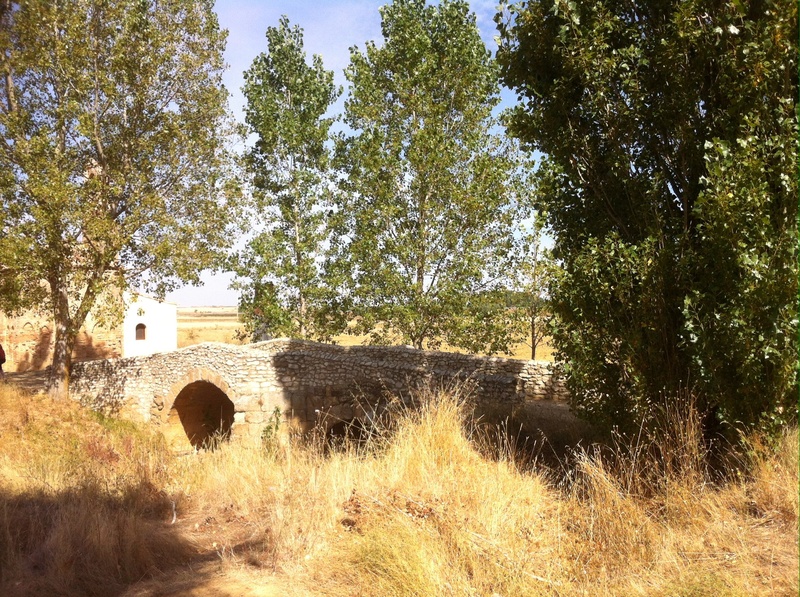 We pass quickly through the outskirts and cross the railway line that cuts through the hill Sahagun is built on via a bridge at the highest point of the hill. Our accommodation is only a couple of blocks from this bridge and tonight we find ourselves occupying the entire lower floor of a three floor building. We have a washing machine at our disposal enabling the chore of washing our day’s laundry to be rapidly completed (luxury) rather than our normal launder in the shower and hang on our elastic line. We meet and chat with our new Aussie friend Ross for a while, buy some fruit and preparations for the next day, go back to our hostel and bring in our already dry clothes (luxury) then head out for dinner. We have been walking with the same crew for a few days now so we are greeted by name at several full tables and end up sitting with our (day one) Orission German friend Andrea and a lovely lady from the Netherlands (whose name I did not catch). There has been some mystery illness striking pilgrims, seemingly at random, causing convulsive vomiting and extreme tiredness and Andrea has been badly affected by this syndrome. Both she and the dutch lady (who has been struck by severe tendonitis in her feet and had been to the emergency ward in hospital) have caught taxis to Sahagun and intend to rest and recover there before moving on. Despite their problems (which put ours in perspective) we are all in fine humour and spend the evening laughing. I notice the trees in the town square have been heavily pruned and the bare branches between the trees are grafted to one another, so in effect the square is ringed by continuous branches. It will look spectacular once the trees have spouted leaves once more. We walk back up the hill to our hostel with our hands grafted. We sleep poorly, my sniffing has been upgraded to the coughing Pam has already suffered through, our bed sags in the middle and we end up rolling into the centre and poking each other to move away through the night. When the alarm goes at 6:00am neither of us is keen to move and we don’t actually start walking until 7:30am. The sun has still not risen so it is the streetlights lighting the yellow arrows that guide us out of town. While we were at Uluru Pam had met a vet (who cared for the camels used in camel rides amongst other things) who had done the Camino in the last twelve months. 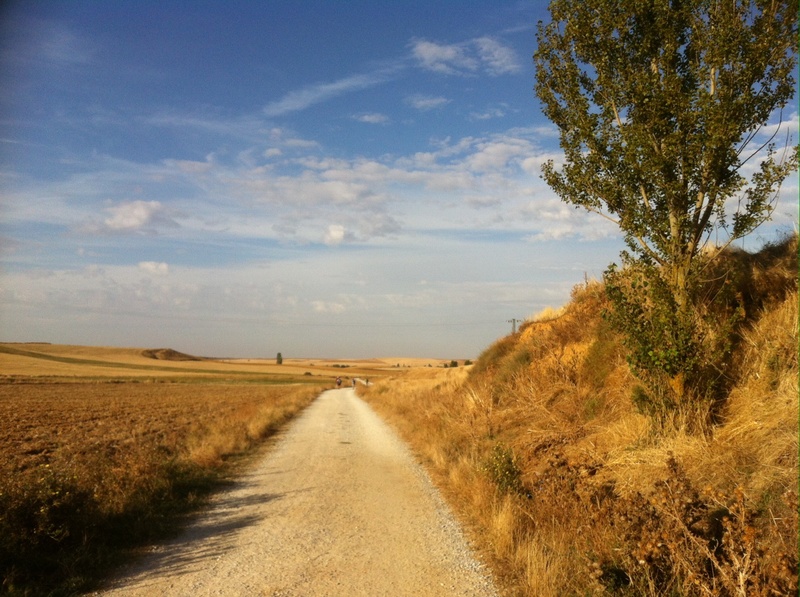 This vet had told Pam that the Camino can end up being a march from one town to another with little inclination to see sights or pause unnecessarily between towns because of fatigue, injury and lack of time. Pam had sworn before we left Australia that we would not be subject to such mundane concerns, that we would be laying down picnic mats in the fields under shady trees and eating the fine foods we were carrying, that we would fully investigate the towns we passed through and arrived in. We were going to be the superhumans doing it all. The reality is the Camino is a march between towns, and unless your fitness level is quite high, attending to preparations for the next day such as laundry and purchasing fruit/food, tending to the health needs of your feet and body and finding time to recover from the exertion of the march (imbibing and chatting) is likely to cut heavily into inclination to spend time and energy seeing all the tourist sights. Today we see them in the morning twilight as we march through the empty streets of town to the chorus of bells on the hour. Sometimes the photos turn out. 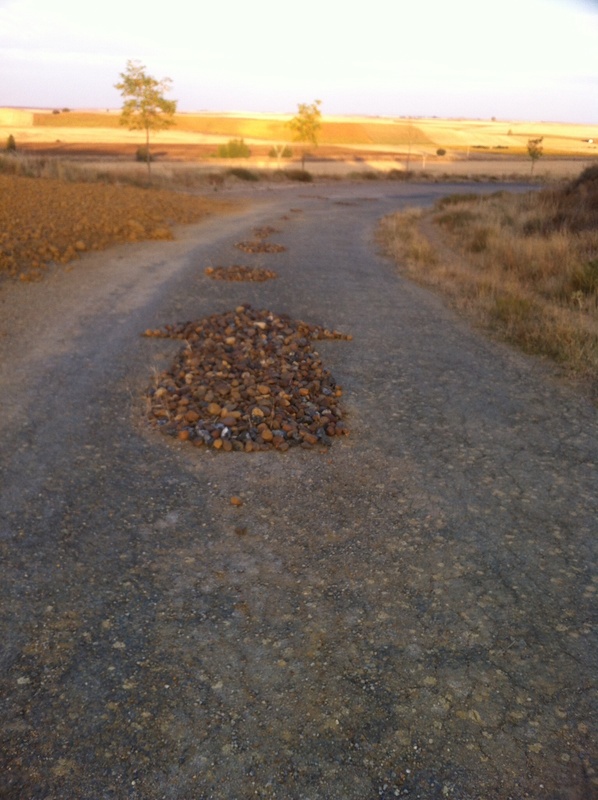 Leaving Sahagun we follow gravel paths beside bitumen roads towards Calzada del Coto. Just before Calzada del Coto the way diverts and the pilgrim can choose to either follow the shorter traditional route or the more modern and winding (and longer) route to the north. As mentioned previously I had done minimal preparation for the Camino however I can still distinctly remember Pam asking me several months ago which way I would prefer to go on this section. I think I have walked through the worst of the pain in my left knee by now and am able to walk relatively normally on lower doses of Camino Candy than for the last few days. Still I am very glad I insisted on the shorter route back then. 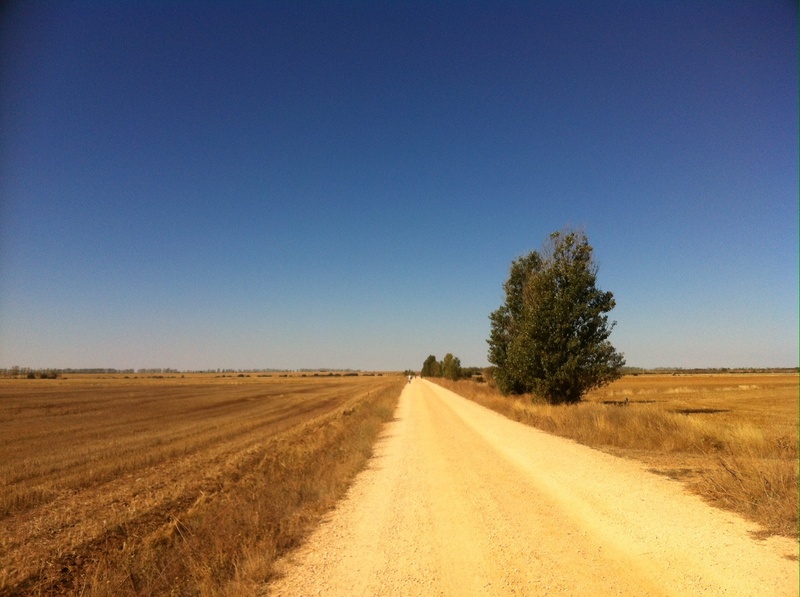 Today the way almost exclusively follows narrow weed infested gravel wheel tracks beside empty bitumen country roads. The busy freeway is within sight a couple of hundred meters to the north almost the entire way. 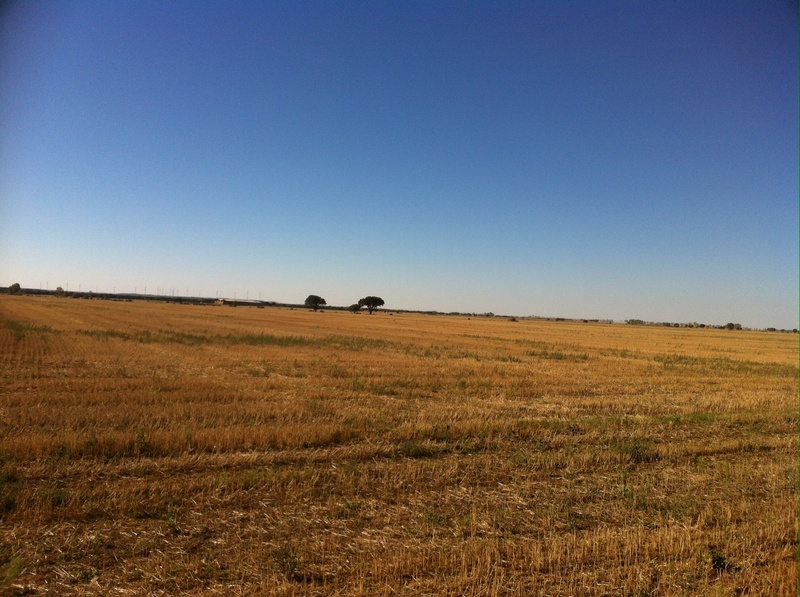 The countryside might be described as flat and uninteresting by some, to me it is like much of rural Australia. 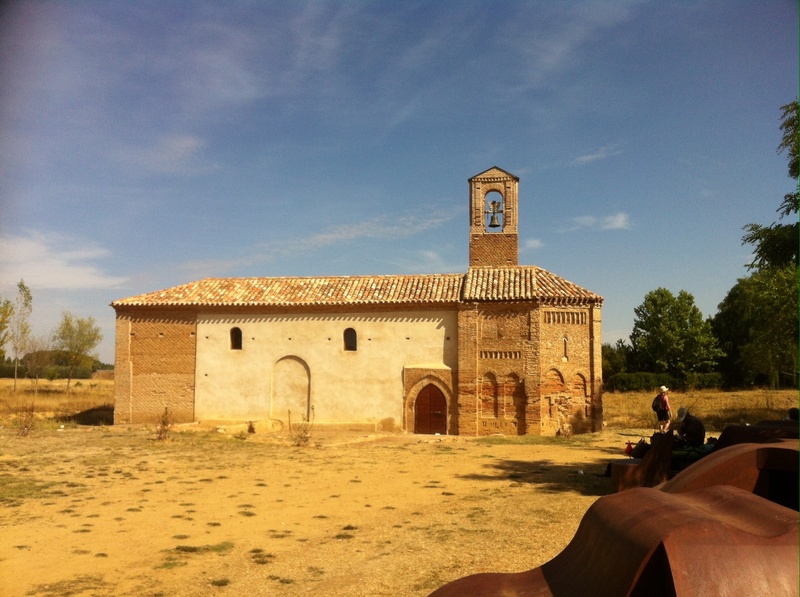 We have walked the ten plus kilometers to Bercianso del Real Camino within a few hours (it always takes longer than you think to leave larger towns as well as enter them). We rest here at a beautiful little bar that has a small garden and clean facilities. The bar is doing a roaring trade. On the way out of town a lovely Israeli girl educates us about the Horse Chestnut fruit and how to cook and eat them as we pass yet another unfamiliar (to me) tree with spiky fruit. On the Camino age barriers seem to break down and communication flows between the young and not so young easily. The shared pain element again I think. We only have to walk eighteen kilometers today however the second eight seem to take much longer than the first ten. We make El Burgo Ramero by about 1:30pm. Although the village is small we have a bit of trouble finding out accommodation and end up lodging in the wrong hostel. Oh well, stranger things happen at sea so I’m told. Where we end up is fine, they have a washing machine (two days in a row with a washing machine is unheard of luxury) and the bed has a foam mattress so we should sleep well. Pam is feeling a little under the weather tonight and so I sit alone, on a tiled balcony with another couple of pilgrims. I have just taken in our dried clothes so we can pack our backpacks tonight rather than in the morning. We should get away to an early start. It is 7:40ish in the evening, the sun in the west is about five degrees from the horizon and is setting to the right of the ever present church tower. Across the road two young girls are climbing a tree, there is a light breeze moving leaves and flags. The Spanish are coming out for the evening, we are near the town square, where the action is. Lets see what is going on. Just figured out how to leave a comment on your website. Glad to hear you are still making progress. We have gone off-stage in an attempt to find available beds. A short day today then into Santiago tomorrow.